It’s Secret Recipe Club time again, and this month’s recipe doubles as a delicious Cinco de Mayo treat! In case you forgot, members of the Secret Recipe Club are assigned a blog each month. Who has who is a secret until reveal day (today!). The mission is to choose a recipe from the assigned blog, make it, and share it! This month, I was assigned the blog 84th & 3rd, written by JJ, an Australian who loves to cook healthy but fun food! JJ’s blog is pretty varied. Though she doesn’t eat meat herself, she cooks it for other people, and though she is not exclusively dairy-free or gluten-free, many of her recipes are. When I first got my assignment for JJ’s blog, I looked through and immediately decided on her Chicken Cacciatore recipe, which looked absolutely delicious. 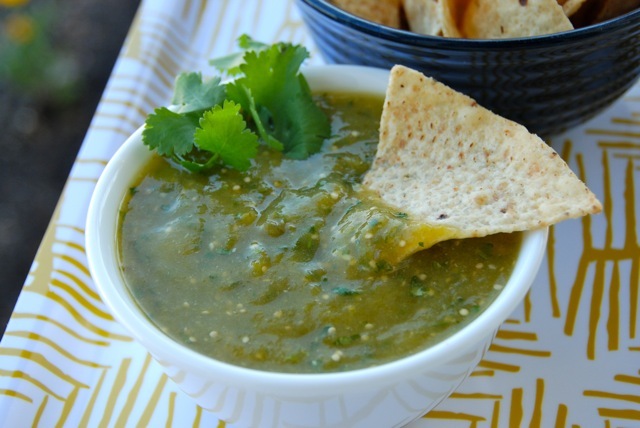 But then a week or two later, I went back to JJ’s site and she had just posted a recipe for Roasted Tomatillo Salsa Verde, and I knew I had to try it! Ever since we moved to California, I’ve been eying the big, mysterious paper-wrapped green tomato looking thingies that aren’t quite as common anywhere else I’ve ever lived. I’ve been wanting to try them, but wasn’t really sure what to do with them. This was the perfect opportunity! Preheat broiler on high. Peel and rinse tomatillos to remove any stickiness. Line a baking sheet with foil. Place tomatillos, jalapenos and garlic cloves on the baking sheet and broil 15-25 minutes, turning and flipping ingredients every 5 mins, until tomatillos are lightly charred on all sides and beginning to collapse, garlic cloves are soft with dark peels, and jalapeno skin is blackened. You may need to take items off the tray in stages so that they do not burn. Place the charred vegetables in a bowl and cover with plastic wrap to steam and cool for 10 mins. Peel blackened skin off jalapenos, and remove stem and seeds. Peel blackened skin off of tomatillos and remove stems. Peel garlic. 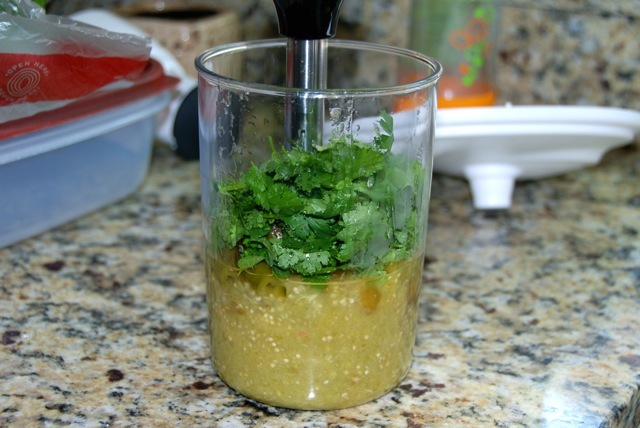 Using a food processor or blender, process half the tomatillos, half the jalapenos and all the garlic to a smooth puree. Add remaining tomatillos, the cilantro and the remaining jalapenos, and process roughly. Stir in the vinegar, lime juice and salt. Serve with tortilla chips or use as a condiment on tacos, eggs, whatever your heart desires! My jalapenos were HOT and the salsa was spicy, but super tasty. If you like it less spicy, use less jalapeno. Luckily, I like it hot! I’m dying to try making enchiladas with this as the sauce… yum! « Why We Love Living in California! Yum!! I love tomatilla salsa, and this version sounds amazing. A fun pick for SRC / Cinco de Mayo and a reason for you to try out tomatillas, win win! Yay! I’m glad I was able to inspire you to try something new 😀 Great idea about using it to top enchiladas! I could have really used a bowlful of your salsa with the tortilla chips I was eating the other day. I adore green salsa, this version looks so fresh. I had that blog last month and somehow missed this recipe. I love chips and salsa. This looks fabulous. Great pick! It was just posted in the last couple weeks… I almost missed it too, but I’m glad I didn’t! Bookmarking this post! I’d love to make this once I have my blender back with the rest of my HHG. My mother-in-law makes something similar, but she includes avocado to make it creamy. But it’s one of those things that no one can make quite like she does, so I don’t even attempt it. Avocado sounds awesome! We served it with some sour cream and dipped the chips into one, then the other… the creaminess was definitely great! 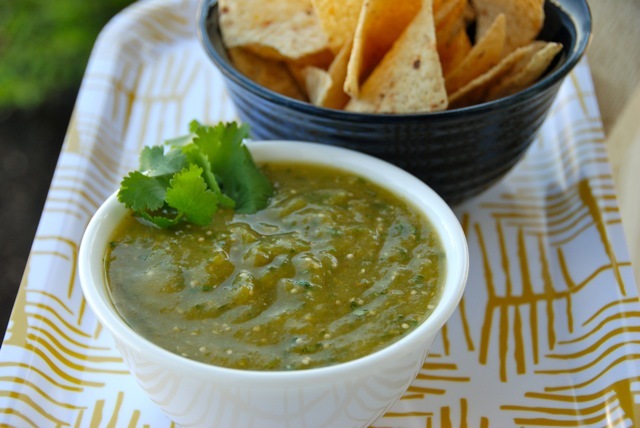 I love tomatillos but haven’t tried making my own tomatillo salsa yet – I need to change that, because yours looks awesome! Perfectly delicious looking! Goodness do I love a good salsa…fabulous job!!! Definitely going to try this…. yum. Yum! this looks and sounds great. Perfect choice, with Cinco de Mayo knocking on our door! I don’t cook with tomatillos often enough, which is odd, every time I use it we realize how much we love it! I have never seen tomatillos here but this weekend I went to go get vegetables to plant in the backyard and they had tomatillos!!! I bought one and can’t wait to try it….I’ve seen so many recipes that use it. 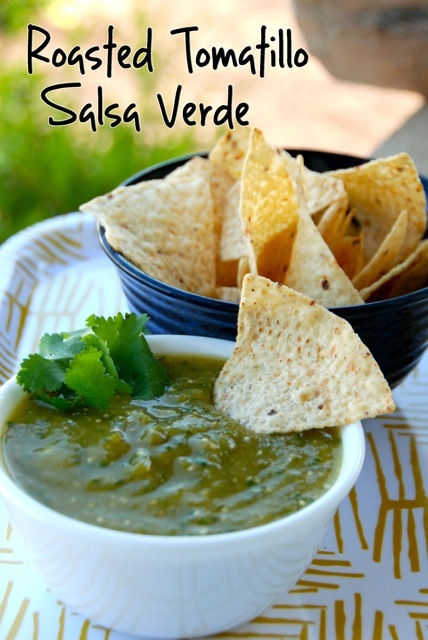 This salsa verde will the first on my list! Great SRC pick!